One of our canvas wall tents made from 10.1 oz weight double-fill cotton Army Duck. We learned a little about canvas while researching wall tents. After we started camping in a wall tent, we’ve leaned a little more. If you are also considering buying a wall tent, here is some information about choosing the type of canvas for your wall tent. You can also read our wall tent buying guide that discusses features beyond the different types of canvas. Canvas is is a heavy, woven fabric that was traditionally made from cotton, but is now also made from man-made fibers like polyester. Canvas is also called Duck, not because water rolls off canvas like a duck’s back, but from the Dutch word “doek”. Canvas has been used for sails, tarps, tents, backpacks and heavy clothing for centuries. For a wall tent, look for Army duck (also called cotton duck or shelter duck; example/source for duck material). Army duck is a double fill (warp & fill; lengthwise & crosswise) canvas, which means the threads are doubled by twisting two threads into a a thicker, stronger single thread and this heavier thread is used in both weave directions, making a stronger and tighter weave canvas. Army duck only means it was made to meet U.S. Army specifications. In the past, army tents were as heavy as 17 oz, but as the joke goes, the tents were so heavy, it took an Army to set them up. Heavier canvas is not always better and the quality of the tent is determined by the weave and by the water, fire resistant and/or anti-mildew treatments. Fire resistant canvas will burn as long as flame touches the canvas, but will not burn if external flame is removed. Fire retardant does not prevent sparks from smoke stack from burning “pin holes” in the canvas. Waterproofing can be a dry silicon treatment or a paraffin treatment, either way, today’s double fill canvas with waterproofing does not leak or seep like canvas used to. New water proofing can be sprayed on canvas when needed. Anti-mildew treatments are important to keep the cotton canvas from mildew damage after it has been wet. Mold and mildew should have a difficult time growing on polyester canvas unless it is dirty and wet. All of these treatments are important and will help the canvas last longer. No matter what type treatment canvas has, it must always be completely dried before storage. Another source says the 12.0 oz. double fill canvas has breaking strength of 389 lbs (warp direction) and 241 lbs (fill direction). The breaking strength of the 10.1 oz. double fill and 10.1 oz. double fill marine treated canvas was 216 and 202 lbs respectively (warp) and 153 and 140 lbs respectively (fill). So, if true that means the strength of 12.0 oz canvas is higher than the 10.1 oz canvas by an average (warp & fill) of 41% while the increase in weight is only 16%. At first thought, this seems to defy normal engineering and physical properties where the increase in weight should be higher than the increase in strength, but hard data is hard to argue against. So consider 10.1 oz canvas for lighter weight and 12.0 oz. canvas for long term semi-permanent camps. 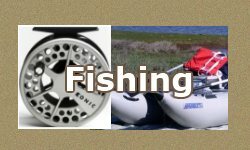 In our case, since we have only camped near the truck, weight is not so important and since we only use the tent about two weeks during the summer and another two weeks in the fall, the 10.1 oz. canvas shows little wear, I don’t think the tent will wear our in our lifetime, as long as we make sure it is clean and dry before storing it. So, In our case, the 10.1 oz. is sufficient, so we saved a little weight and a little money. Make sure you know how much your canvas is expected to shrink. Some canvas claims to have already been pre-shrunk. I was told to expect 3% shrinkage for one of our wall tents, but some canvas can evidently shrink up to 10%. When I cut the EMT poles for the internal frame for our tent, I planned for the full 3% shrinkage, because I didn’t want to have to re-cut poles every time I set the tent up. But our tent has not shrunk more than about 1%, so the tent still sags on the frame. Three percent may not sound like much, but it adds up to just over 5 inches for the 14 foot length. I wish I had planned on about half the shrinkage at first even if I had to re-cut the poles later. Canvas made from polyester should not shrink much. 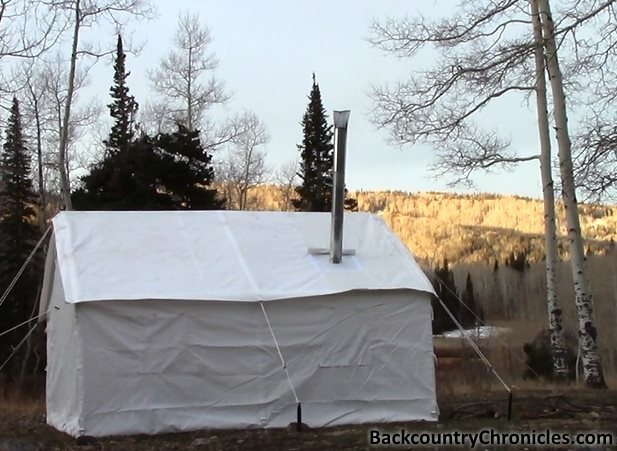 Our Elk Mountain Wall Tent (13 x 13 ft). There are many other fabrics used to make tents today and some wall tents are also made from man-made fabrics. Polyester Based Canvas – Our newest wall tent was made by Elk Mountain Tents of Nampa, Idaho – the 10 oz. canvas is lightweight (13 x 16 foot tent weighs about 60 lbs) and durable, less susceptible to mold and mildew and less likely to absorb water like cotton. The polyester fabric also doesn’t shrink. X-Treme Tent Cloth – used in Cabelas’ Alaknak Tents – a 250-denier polyester oxford cloth which is lightweight, very strong, durable and resists exposure to UV rays. We also looked at the Alaknak Tent at Cabelas’, but decided against it after seeing the tent setup and examining the synthetic material. If you read some of the reviews, it is obvious that the material can not breathe, so condensation is a big issue. To compensate for the condensation, the newer tents have so many vent holes that according to some, the tent is hard to keep warm. I was also concerned about snow building up on the complex shaped Alaknak roof and that sparks from the stove would burn many pin holes in the fabric. Relite is another polyester-based fabric used for lighter weight wall tents. Some tents are “blended” with Relite and canvas, where the roof is made from canvas, but has Relite side walls, end wall and door. These tents are advertised as 40% lighter than the same tent made of canvas. But I have read reviews claiming Relite starts to show a lot of wear within a few years. So it might be an option when reduced weight is absolutely necessary, but don’t count on it lasting 20+ years like good canvas. 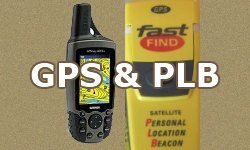 I’m looking for wall tent material about 240 linear feet. Randy: Here is a good source for 10 oz. Cotton Duck canvas. This fabric is 60 inches wide. Thanks for the information in the article. I am looking for a canvas tent that is durable and not easy to cut. All canvas can be cut, but it shouldn’t happen to the canvas used in wall tents even under heavy use. We just got our newest tent from Elk Mountain Tents. See what you think. We’re wondering about your experience with the Elk Mountain tent. 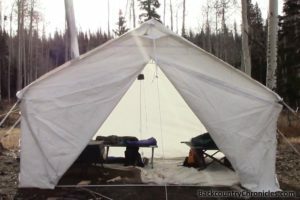 Hi Joe: Our 13 x 13 foot Elk Mountain Wall Tent is a good tent. It is much lighter than our other tent for two reasons. One the polyester fabric is lighter (but plenty strong) and second, the internal frame design and hardware is lighter (and cheaper). I was skeptical that the frame would be strong enough, but it is. The framing system includes cables that add plenty of strength to the rafters without much weight. The Polyester fabric also does not hold moisture like canvas duck fabric will. I have said and written this before, but I’ll say it again here for your benefit. I nailed a piece of the Elk Mountain Tent fabric to a post in my garden almost 2 years ago. One side is exposed to our high elevation full-strength Sunshine 100% of the time and the other side is in the shade, which means it is damp almost all Winter. Except for some dust, both sides look brand new. The Elk Mountain tents also costs less, so you can get a larger tent for the same money or pay less for a similar sized tent. You will also like the fact that since the polyester fabric does not shrink after getting wet, you will not have to guess at how much the tent will shrink. That means you will not have to cut the internal frame poles short to plan for shrinkage. Notice how saggy my other tent is in the post above (top photo). That is due to planning for shrinkage that has not fully occurred yet. In case you haven’t seen the photo of our Elk Mountain Tent I posted a photo in this post and also can be seen here and here. Good luck with your new tent. What kind of camping do you plan to do with it? It seems like a lot of companies are using the polyester fabric now, and I been trying to do my research. I’ve seen some reports that these tents will condense on the inside like a nylon tent will. Have you noticed this? Hi David. I think more tent manufacturers will start using polyester to save money and weight. To your question, no I haven’t noticed the polyester sweating, but so far, we only used a wood burning stove inside the tent, so humidity is low. But I have a friend that uses a propane heater. That should cause lots of condensation, but he says it sweats less than canvas because it can breathe. Contact Elk Mountain Tents. They will sent you a piece of fabric and You can test it. 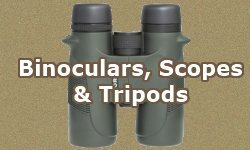 I’m wondering what kind of fabric has the best insulation for high altitude winter hunting? Does the polyester based canvas as insulated and keep you as warm as the regular canvas? I was also looking at the cabelas alaknak tent and wondering if its material had good insulation? Thanks. I don’t really know, but my guess is there is very little difference between cotton and polyester as insulation as it relates to a wall tent. In most conditions, a good stove “over powers” the situation and you will be opening a window. In extreme cold I am also guessing that more heat is lost through radiation to the night sky than through the sides of the tent. A tarp or fly may do more to reduce that heat loss than the difference between fabrics. I remember looking at an Alaknak tent and thinking this can’t be well insulated. 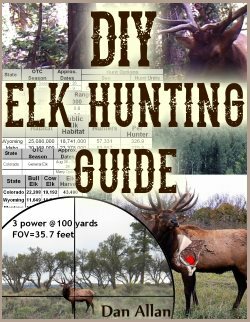 Either way, it is doubtful you will be sleeping on top of your cot unless the stove is running like a jet engine… but then, you will be spending more time collecting fire wood than hunting. Best bet is a great sleeping bag to start, then good heat source in tent as back up. Problem is, good stove is heavy and is even hard to pack with horses. Most use collapsible stoves, which are not great for putting out heat. Interesting question Mitch. Bell tents seem to be used more in Europe. Seems like the origin is from a similar tent to Tee-pee used by native nomadic tribes, also like a yurt used by nomadic people from Mongolia. Lately, I have seen Bell tents showing up, but they seem to be marketed more towards glamping than for traditional elk or deer camp or civil war reenactments. But wall tents can also be for glamping (luxury) depending upon the extra features like zip in floors etc. As for Pros and cons, the traditional wall tent can be set up “in the field” with bush poles and rope or close to the truck with a internal frame. 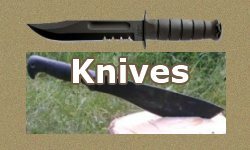 It helps with wind and removing sage if you can also to stake the traditional wall tent all the way around, but it is not absolutely necessary. Bell tents have to be supported by a center pole and must be securely staked down all the way around for this pole to remain in place. This could be a problem in rock areas or could be a problem in strong winds. I have completed set up a wall tent by myself, do not know if that can be done with a bell tent or not. Another thing that seems obvious, is the square or rectangular shape of the wall tent makes the floor space more usable. Putting square furniture, cots, tables, stoves etc into a round space will create some wasted (or maybe a should say less efficient) use of the floor space. It appears that the square footage of wall tents and bell tents compare based on size. A small 4 meter bell tent has 135.3 square feet which is larger than a 10 x 12 foot wall tent (120 sq ft) but smaller than a 12 x 14 (168 sq ft). 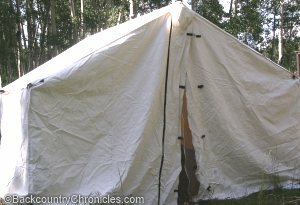 Here is a 13×16 foot wall tent for comparison. A large 7 meter tent is 414.2 sq feet, which is almost exactly the same size as a 18 x 23 foot wall tent. Another thing is actual head space in the tent. Wall tents usually have 5 foot walls, so most people can stand up fairly close to the wall without their heads touching the top of the tent. I will do more research (not easy to find dimensions at bell tent websites), but it looks like bell tents are about 2 feet high along the edges. The roof pitch is very steep, but it will still mean you can not stand up next to the wall without rubbing your face on the tent. Some of the bell tents I have seen seem very expensive, but in fairness, they were being marketed for luxury features. Here i a reasonable price for these small to medium sized (4 & 5 meter) bell tents. Or these bell tents (3 – 6 meters). Thanks for your question, I may add more to this comment later after I do more research.